Greetings from the Chair of Doom. This time I write with some good news. When I started the weight loss, I weighed in at a tick over 330 pounds. This morning, I weighed 280.0. That means that the first fifty pounds is down. Still have 30 pounds to go to get myself ready for the Segway tour, but I’m a lot closer than I’ve been in a lot of years. This goes to show what a steady balanced diet can do for you. I’ve lost weight with no exercise at all, other than the periodic visit to the bathroom and up to bed. I’m really encouraged that it is coming off and I think it should get easier with exercise. I think I’m really missing the freedom of walking. Walking has been my preferred exercise since I started this. I like being able to put on some tunes and get some fresh air. I’ve never been a runner (when people ask if I run, I say “Only if chased.”), but walking is pretty much my speed. I’m hoping that I will be able to walk regularly again. I’m hopeful, since I won’t be losing my entire toe. I’ve read some blogs from people who’ve lost an entire big toe and it’s no picnic. If I can’t walk like I used to, I at least have a good memory of the last walk I took before landing in the hospital. 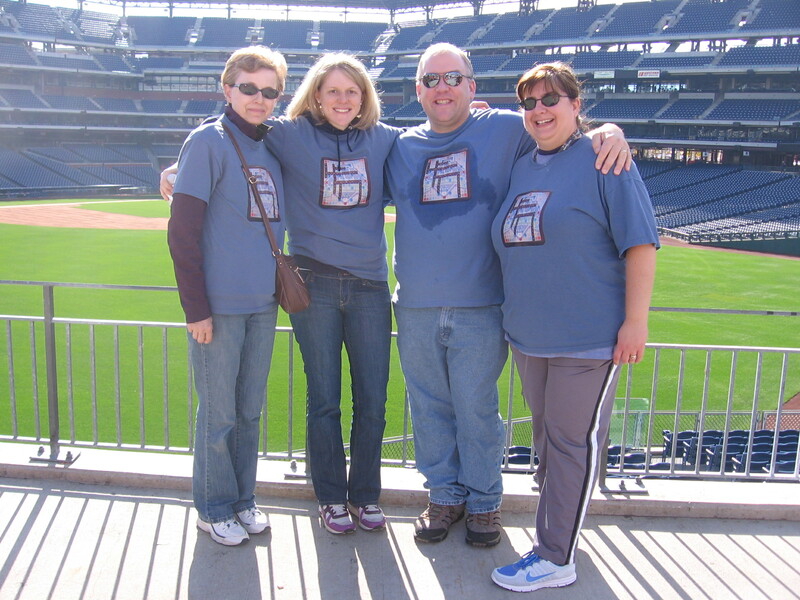 The Management and I joined our friend Margot and her mom for the Alzheimer’s Memory Walk at Citizens Bank Park in Philadelphia on November 14. The way I sweated during the walk probably shows that I wasn’t in the best of health, but it was still a great day for a great cause. Perhaps the neatest part of the walk was being at the ballpark while it was empty. I’m used to being there with 40,000 people and to see all the empty stands was very different. So, I’m going to continue with the diet and see how it goes. Thanks again for your support. This is not an easy fight, but knowing that family and friends are willing to support you helps a lot. In a way, weight and diabetes are a lot a like. Both take a lot of effort to manage and keep under control, but both can be controlled. Awesome news that you won’t be losing the entire “toe of wonder”, Brian!! Less is definitely MORE in that arena ! !